Ask fellow campers about "Small Towne RV Park" and nearby attractions. If you appreciate vintage small towns and small business entrepreneurs, you'll enjoy this spot. Long gravel sites, mostly level, grass islands, very basic, but the owner, as described in other reviews, is delightful. We camped at Small Towne RV Park in a Fifth Wheel. Evelyn Cameron Museum within walking distance--nineteenth century local photographer's work. It was a wonderful view into life long ago. We are in Terry, Montana at Small Towne RV & Campground. The manager greeted us yesterday outside as we pulled in. He brought a small galvanized lined garbage can with a lid & handle, welcome mat for our stairs & a binder with info in it from WiFi stuff to maps of area, coupons for nearby cafes!! Today we woke up & on our front steps was the Billings Gazette Newspaper!! And the little bit of trash that was in our personal can by our RV was empty with a clean liner!! It's a small RV place but the sites are wide & some have trees. We were on the end & it was like a park setting right outside our door! No amenities but great personal customer service! Thanks for making us wish we had planned a longer stay!! We will be back!! We camped at Small Towne RV Park in a Fifth Wheel. As stated by others if you're looking for a fancy resort just keep on going. But, if you want a good friendly and safe place, this is it. We had called ahead and were greeted by the owner who treated us like family. He made sure we got into our pull through and everything was working ok. He also provided us with a door mat, personal trash can for site, information notebook of area, and fresh eggs from his "girls" he said. We also had a daily newspaper placed on our steps both mornings we were there. Our stay was on July 4th and the owners invited us to their home for a cookout with homemade ice-cream and fireworks. 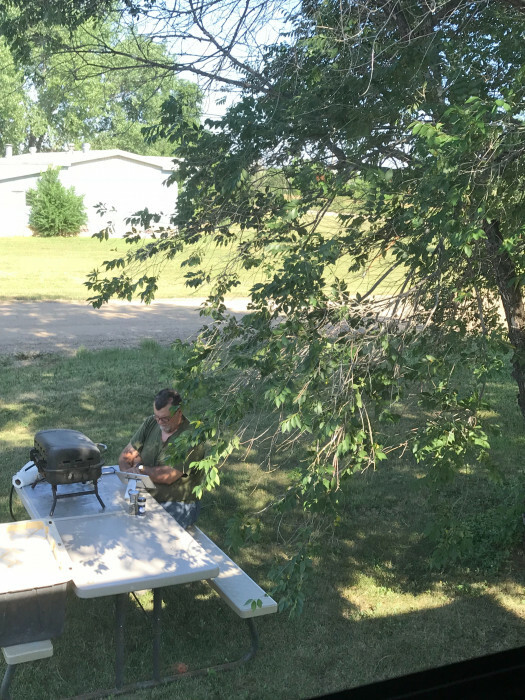 We camped at Small Towne RV Park in a Fifth Wheel. We also recommend the "Hog & Jog" restaurant downtown (3 minutes from CG). Great food by the owners and probably the best sweet rolls I ever had made on-site. Also very friendly people who make you feel welcome. Very friendly and hospitable. Great place for an overnight or short stay. Owner greeted us with a private garbage can, a welcome mat, a notebook of area attractions and coupons and some fresh eggs from his chickens. Town is small and the roads are a bit rough but worth the rate. $25.00 cash or check only. When in the area we would stay here again. We camped at Small Towne RV Park in a Motorhome. State attractions and Museum in the area. Thought we would give this guy a shot. Pulled in, one trailer already there. Just pulled in to a site, called his number, because of the four dogs out side of the house. No answer Left VM, waited for a bit. No call back, decided to move on. Area was muddy and huge puddles due to recent rains and would have made for a mess with the dogs. We camped at Small Towne RV Park in a Fifth Wheel. We have stayed at this park before and if you want ambiance, resort facilities, frills, manicured lawns, or are just hard to please, you my want to keep on driving. This little park has a friendly owner, pretty good wi-fi included in the price, long pull through sites with good swing room in and out for larger rigs, and level gravel sites. Verizon worked well too. His personal service is the door mat and small garbage can as well as a booklet with local information and discount coupons when he greets you with upon arrival. We had full hookups and everything worked as it should. We would stay again. We camped at Small Towne RV Park in a Motorhome. A large easy in easy out self serve fuel station entering town, not busy and competitively priced fuel. Stayed one night on the way to Western Mt and stayed one night on the way home. We had full hook ups and everything worked OK. The owner is a nice young man and is trying hard to get the park up and running. Next trip we will spend a few days in Terry and Check everything out. We camped at Small Towne RV Park in a Fifth Wheel. Gravel sites, level, one 50amp, water and sewer, WiFi guit working soon after dark. Train tracks and I-94 noise. We were the only ones besides 2 permanent trailers. We camped at Small Towne RV Park in a Motorhome. It is an old trailer park turned RV park. There are no trailers currently at this site. It is a laid back type park. The owner welcomed us with an outdoor mat, 1/2 dz eggs and a binder of information about the area & a couple of coupons. The campground has full hookups, including 50 amp. We drove north of town to Scenic View, which overlooks the Badlands. It is a beautiful view. The Calypso Trail is west of town. We had already seen it, but it is best to go with a rugged type vehicle and some guidance from someone local. We camped at Small Towne RV Park in a Fifth Wheel. No thrills just good value. Very friendly staff of a bare bones park. Free eggs, a welcome notebook of what's available locally makes up for no showers, bathroom or putt putt golf. We camped at Small Towne RV Park in a Motorhome. Don't worry about the dogs. They stay in their space and are very friendly. We were happy with our overnight stay in Terry. 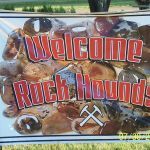 We were able to go rockhounding within a few miles. We also drove the Calypso trail to look at the Terry Badlands. The drive is 2 miles from town and well worth it. We have a Jeep but did not need 4 wheel drive. 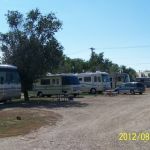 This is a small RV park but it actually has full hookups at the site which many parks do not and they don't overcharge. We would stay there again. We camped at Small Towne RV Park in a Motorhome. Dirt road, gravel sights. Guy is super friendly. A great place to stop for a night or two. As someone else said if you want a resort place this isn't it. If you want to come rest and relax this is the place. He gives you fresh eggs, a garbage can, a book with info and coupons. We camped at Small Towne RV Park in a Motorhome. We just got here and set up. It was evening so not going into town. It was nothing fancy but it was clean and the owner was very nice. He helped set up, brought a trash can and door mat over and then sat down with us and gave us a book with info for Terry and surrounding areas plus coupons for local businesses. We saw him the next morning at breakfast and he made sure ask if everything was okay and if we needed anything. We will stay there again and will tell all our friends about it. 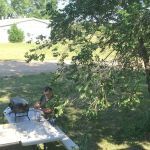 We camped at Small Towne RV Park in a Fifth Wheel. Quiet, clean, easy walk to town. Owner very friendly and helpful. Gave us a notebook about all local attractions. He even provided a clean garbage can and welcome mat for steps. We camped at Small Towne RV Park in a Motorhome. Move on down the road. OK for overnight stay, but had my doubts driving in. Terry is one of many prairie towns that has seen its activity diminish over the years. But these towns are always interesting to stop by and talk to the local folks. There is a very good museum in town as well as a shop that sells Montana made items and of all things, model airplane and other models. Worth taking a walk to look the place over. A few restaurants in a "small town" but not open every day. People very friendly, if you can't tolerate the bugs, stick around the campfire. The downtown historical museum is funky and the Evelyn Cameron Gallery is a wonderful photographic study of life in Montana during the late 1800's. Two "not to miss" adventures if you have a higher clearance 4wd vehicle are the Calypso Trail (20+ miles) and Scenic View Drive (6 miles) both of which take you into the Montana Badlands. While the going is a little bumpy and rough in places, make it to the end of Scenic View where views are breathtaking. Are you affiliated with Small Towne RV Park ?